Jamie Donaldson kept his cool in the white-heat of battle to claim the US$1 million Thailand Golf Championship last Sunday, going seven-under par for the final round and claiming a three-stroke victory at the Asian Tour’s showcase event. The Welshman nailed a clutch putt on the Amata Spring Country Club’s signature 17th hole, which features a floating island green, just when it looked like his lead was there for the taking. 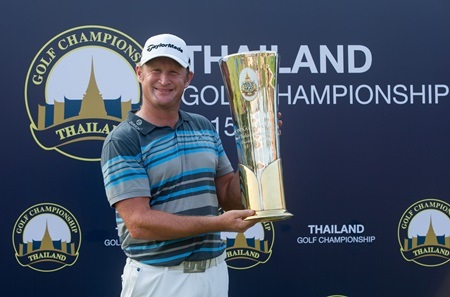 Jamie Donaldson of Wales holds up the trophy after winning the 2015 Thailand Golf Championship at Amata Spring Country Club in Chonburi, Sunday, December 13. Donaldson went hard at the hole with his putt on the par-three, the ball bounced up for a heart beat … and then it disappeared, as did the hopes of unheralded Frenchman Clement Sordet and two-time winner Lee Westwood who had clawed back Donaldson’s lead with birdies to his bogey at the previous hole. America’s Bubba Watson celebrates his hole-in-one at the fifth hole on Sunday. That pair finished tied for second at 18-under par after final rounds of five-under 67 for Westwood and two-under 70 for Sordet. “It’s been a awesome event,” said the 40-year-old Donaldson. 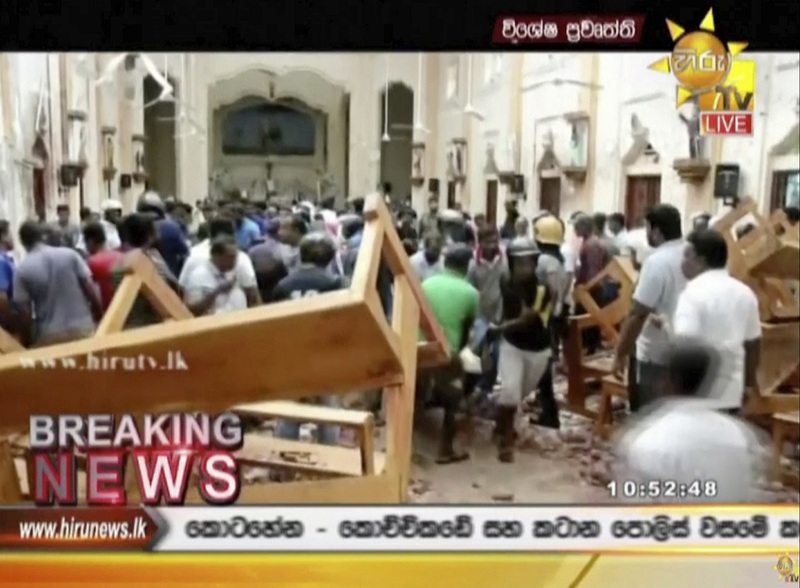 “The weather’s probably been the hardest thing to deal with as it’s been so hot all week. But I’ve had a great week. It’s an awesome tournament. “It was a good job that putt on 17 was on line as if hadn’t gone in, it would have been in the drink. But it was right at the middle of the hole all the way. I just had to hope it would stay in and it did. The victory – the eighth of Donaldson’s career – also secured him one of four places that were up for grabs at The 145th Open Championship, to be played next July at Royal Troon. He’ll now be joined there by Sordet, Westwood and 16-year-old Thai sensation Phachara Khongwatmai, who finished Sunday alone in sixth-place at 13-under, one place behind world number 12 Sergio Garcia and European Tour Rookie of the Year An Byeong-hun who both finished on 14-under and who were already exempt for The Open. 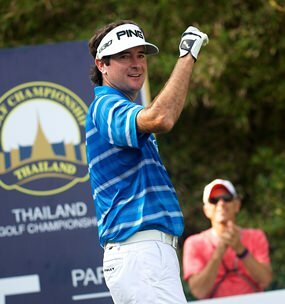 World number four Bubba Watson, the top-ranked player in the field, produced a magic moment when acing the fifth – and the American said it would be a memory he would always cherish as he fired home a five-under 67 to finish the tournament on eight-under-par. For overnight leader Sorbet, who came into the Thailand Golf Championship ranked 481 – a number that will shorten considerable once the world rankings are updated – the final day was lesson in what it takes to win an event packed full of the world’s best players. The 23-year-old Frenchman had blitzed the course on Saturday but couldn’t find the same touch Sunday. 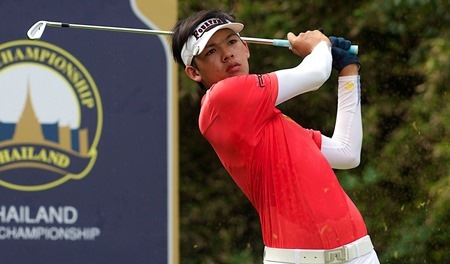 Thai teenage sensation Phachara Khongwatmai tees off during the final round of the championship. “It’s been an incredible first six months as a professional and great to end the year with a spot secured for The Open next year,” said Sorbet, who received the championship’s final invitation. Still, the 42-year-old was looking to the future and the fact he too will be lining up at The Open once again. 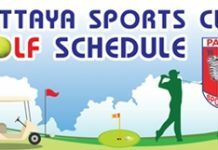 Teenage sensation Phachara had the local galleries roaring their approval all day as he shot a final-round six-under 66. He’d won his way into the field via last Monday’s qualifying round – and said he simply could not believe his luck. “I didn’t expect myself to play so good,” said the Thai player. “I was already very happy just to get a chance to play with the top stars this week. I surprised even myself to finish so well.